Carter Cookson, the three-week-old baby who urgently needed a new heart, passed away Jan. 19 after a donor was not found in time. (CNN) - Carter Cookson, the three-week-old baby who urgently needed a new heart, passed away on January 19 after a donor was not found in time. The Facebook group, Find a Heart for Carter, shared a post from his mother Saturday letting followers know that he had died. 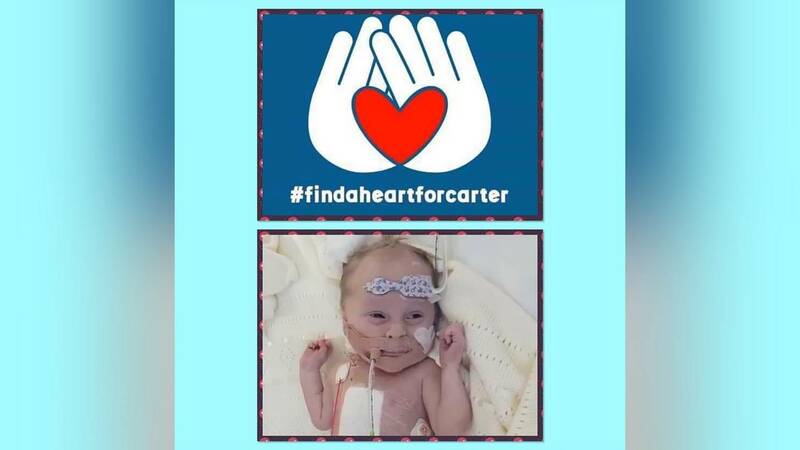 His parents, Sarah and Chris Cookson, started the social media campaign #findaheartforcarter, hoping to locate the heart that their son needed to survive. "Today he could not fight anymore... at 5.44 pm our brave baby boy Carter John Cookson gained his angel wings and flew into his big brothers arms," the post said. The Cookson's first son, Charlie, died in 2013 at the age of two. He had an unidentified progressive disease that caused frequent seizures and he was unable to breathe, eat or sit up without help. His parents posted their thanks in the Facebook group to everyone who had tried to find Carter's "gift," stating that they would be "eternally grateful." Chris Cookson previously told CNN that he hoped Carter's story would encourage others to join the organ donor register, and to support the move to an "opt-out" organ and tissue donation system that has been planned by the UK government. A post from Sarah Cookson was shared on the Find a Heart for Carter page saying that she can "see the impact our Angel has had, in just over 3 weeks in my heart I believe he has changed peoples minds and saved lives." Carter, from South Shields in the Northeast of England, was born on December 26. He suffered three cardiac arrests after his birth. During surgery to fit a pacemaker doctors found dead tissue in the left ventricle of his heart. He was treated at the Freeman Hospital in Newcastle. Doctors initially predicted that he had five weeks to live without a transplant. However, on January 16, his parents were told that a donor needed to be found within three days. Problems with blood clots in the ECMO machine, a life support apparatus the performs the function of the heart and lungs, that was keeping Carter alive led to the reduction in his life expectancy.